Pat and I agree that living a full life is about ADVENTURE -- being zesty about the adventures we go on intentionally and being graceful and strong about those that are thrust upon us. And of course the demons of our own weaknesses are always lurking around, challenging us to do battle. Right now (my life being calm and predictable), I want intentional adventures that involve creativity, learning, and a visible product ("something to show for it"). Skydiving and hang-gliding? Include me out. The arts? Oh, yeah. But just as Pat and I were laboring over our cosmology together, I spend a good deal of alone time fussing over the "magic formula" that will nurture and expand my capacity to have the best intentional adventures. See October's Waking the Sleepy Dragon, for example. Or My Personal Energy Thermostat, from August. As a result of my latest conversations with Pat, I've come up with a new diagram, drafted below. I have made much of my need for abundant "raw material" to work with. Connecting this with yesterday's cosmology, I'm thinking that, for me, the Source -- that energy grid of the universe (aka God) -- emanates up through my raw material. My access to creative power doesn't open by just thinking about all that raw material. I have to dive in and start working. I can't just lovingly collect tools and methods. I have to use them. I can't let my personal energy come and go as it please. I can't sap it by not getting enough sleep and exercise or by gorging myself with low-nutrition food and alcohol. Gotta be primed for action. Feeling good, having all my tools lined up, then laying my hands on my raw material to begin work -- that's when the power comes. Scraps get pieced into a charming quilt. Cartoon characters spring to life. The world of an ancestor takes shape. Bits of research are transformed into a story. A doll is born and tells me her name. 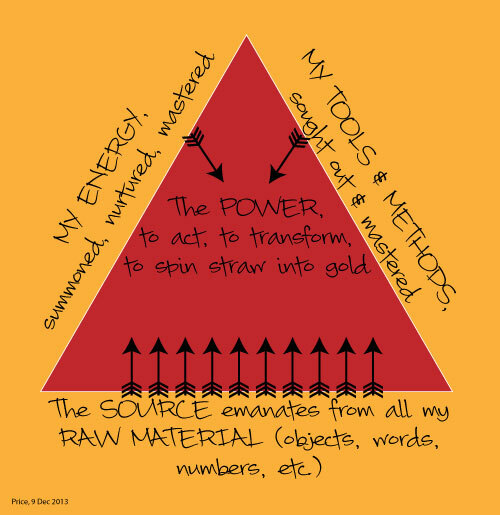 I like that it feels a little magical -- me all energized and tooled up, summoning the Source to turn an idea into action. It also feels sexual: Me plus You equals Offspring. Heh. 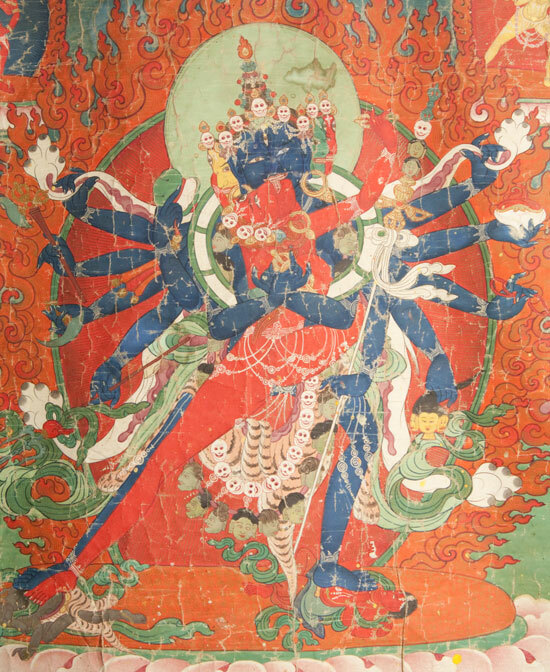 That sexual metaphor caused me to include the photo at the top -- the male Cakrasamvara consorting with the female Vajravarahi. It is the Tibetan symbol for the divine union, "yab-yum," which transmutes the heat of passion into the warmth of compassion. Somewhere I read that this was the union of wisdom with skillful means. Yep, being creative means getting hot and heavy with your material so you can get that rush of ecstasy when you finally touch the Source. I like that. I'm always fascinated by mystics and their ecstatic moments with the Spirit. But I feel like I've been taught that this is the result of the saints fasting and praying until they are totally emptied out. They become empty vessels to be filled by the Lord. This kind of language makes me back off. Passivity and subjugation to the power of a Lord are not inspiring concepts to me. And I have a feeling St. Terese of Avila would agree. My new model makes the transformational experience more of a collaboration. If I work really hard to attain mastery of myself and my tools, then You will be there with your part. I don't need to surrender my autonomy to a superior being. But I do need to surrender my ego and have faith in the process. Well, that's my deep thought on a winter's day.